← Putting Crimpers to the Test: How Good Are Our Crimp Tools? Did you have peas for dinner or something? Now _this_ folks is a hack most worthy of being saluted. Dang that is clever! Glad I read the article, despite not being particularly interested in bats! Definitely throwing the signal->clock idea in the ol’ toolbox. That is hilarious! For another take on this technique, look at Scanlime’s RFID tag emulator. If he had used a 4013 and added a diode and a cap he could have harvested the required energy from the piezo, done away with the battery or power supply and entered it for a hackaday prize. This looks like fun. Is the mic sensitive enough to pic (pun intended) up the bat sounds? Or do you need a pre-amp? interesting. i wonder if the PIC could be replaced by one or two transistors. Very nicely done! I think the frequency division is even more than 1/4, when flipping a pin you need two flips to count as a full wave, and the main loop consists of 4 to 5 instructions, maybe more. It would probably take 10 instructions for a full wave, and 40 clock cycles. From 20kHz-100kHz down to 0.5kHz-2.5kHz. One 74LS90? No MCU needed. You would probably have to add amplification/conditioning circuitry between the transducer and the input. This stuff is already included inside the PIC. Does this actually work to detect any bats? Those piezo transducers behave like a very narrow-band filters and they are typically tuned to resonate at either ~20kHz or around 40kHz. From my quick testing a typical transducer like you could find in a cheap distance sensor or car parking sensor has a passband of only few hundred Hz around the center frequency, then the signal is very strongly attenuated. While the circuit is a neat hack and it may pick-up wideband noise like those keys or strong signals from similar transducers it likely won’t pick up any bats which emit their “clicks” at higher frequencies. 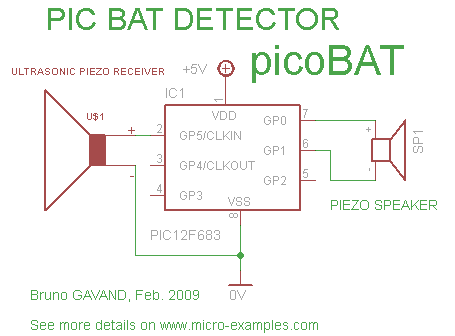 Bat detectors use microphones not these narrow-band piezzos for this reason.